Firefox has been freezing on me. This started happening maybe a month ago, but is getting progressively worse. Generally, I will try scrolling on a page, and it will stop responding. Sometimes if I have another open tab, I can switch to that tab, and it is responding, but often nothing works in Firefox. I can switch to another open program, and switch back. At which point the Firefox window is blank for a second, then comes back, and usually is responsive again. Or it may come back with the same frozen page and not respond for some (seems like forever) seconds. Opening a new page may cause the freeze to happen again. I am running Bunsen-hydrogen, and Firefox 52.9.0. I have about 3 GB of free memory (as reported by conky) and about 2 GB of free disk space. It mostly only freezes on LARGE pages, like youtube or facebook. Any idea what could be causing this, and what I can do to get a responsive system back? You run any browser extensions? It could just be all the cra.. err cruddy scripting everywhere, You tried wit uBlock Origin? It doesn't kill the scripts, but with all the ads it blocks you have many less trying to run. Does Chromium do any better? 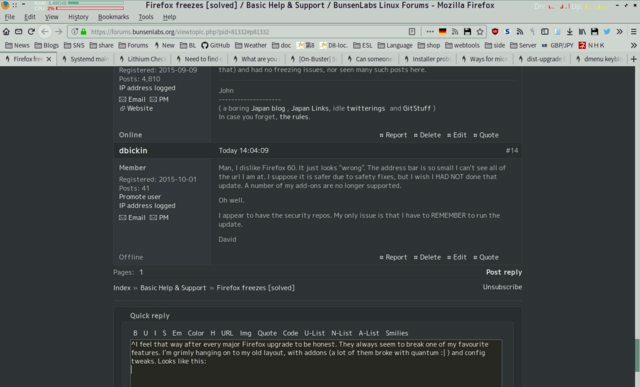 I believe it was in another thread that we realized placing firefox in /opt and having it auto-update meant the permissions needed to be set as in the OP of the link thread (meaning, the files extracted there and moved without any changed), but I can't find the thread. I guess I can try uBlock and see it that fares any better. Odd that everything was working fine for quite a while before the freezes started. ^ yeah try uBlock Origin. It is said to be much lighter than Adblock. Also try to disable (uncheck) Smooth scrolling in the preferencces. and about 2 GB of free disk space. I had the same issue with v52.x-esr - horrible sluggish behaviour with seemingly no cure. After many attempts to fix that, the only concrete thing I've had was my unproven conclusion that the mentioned version does horrible job with multithreading on mylaptop for whatever the reason, because I've noticed that one (out of four) CPU core gets stuck on 100% by browser process every now and then. It all disappeared when I upgraded version to 60.x-esr. I don't exactly remember if I've followed the above mentioned steps, but my own brain says it was just plain sudo apt update && sudo apt upgrade. Bunsen Hydrogen runs on Debian Jessie, and the current version of Firefox there is 60.4.0esr-1~deb8u1. You do have security updates enabled? If not, you should do so immediately, and install all the upgrades available (including Firefox). The only architecture for which Fx is currently 52.9 is armel. After installing 64.02 I have still had no freezes, prior to that, when I was using 58 (or was it 52 - i think 58)ESR, it was not only freezing but also the spell checker was underlining almost every word as misspelt. the problems were not caused by adblock plus as I was using ublock origin to test that hypothesis and it still froze. The freeze that finally convinced me to uninstall it and reinstall from the mozilla repo actually froze the entire computer and when I rebooted there were problems with the background image being repositioned so that the centre of the wallpaper was at the left hand edge of the screen. Took me a while to put that right but managed it with feh. I think the issue is just that the ESR version is rubbish thats my professional opinion LOL. the only concrete thing I've had was my unproven conclusion that the mentioned version does horrible job with multithreading on mylaptop for whatever the reason, because I've noticed that one (out of four) CPU core gets stuck on 100% by browser process every now and then. I guess I haven't run an update in a while! Synaptic said the latest version 52. After running an update it does now say 60. So that is installing as I write this. PS btw, I removed adBlock and replaced it with uBlock, and my freezing problem is mostly gone. I suspect what freezes I now see are the horrible network connection not being able to keep up. I think most users here do updates and upgrades from the terminal, you could look into the unattended-upgrades package if you want things to happen by themselves, I'm not sure if it gets configured, or how when you install it, you might need to do some things to get it going, once it is it'll do security updates without intervention. There was talk of possibly including it in bunsen, and then debate over if it should be enabled or not, or a question in bl-welcome. I guess I haven't run an update in a while! more convenient than using synaptic. A tad over the top IMHO. I've been using Fx ESR ever since it was available (plain Fx before that) and had no freezing issues, nor seen many such posts here. Man, I dislike Firefox 60. It just looks "wrong". The address bar is so small I can't see all of the url I am at. I suppose it is safer due to safety fixes, but I wish I HAD NOT done that update. A number of my add-ons are no longer supported. I appear to have the security repos. My only issue is that I have to REMEMBER to run the update. 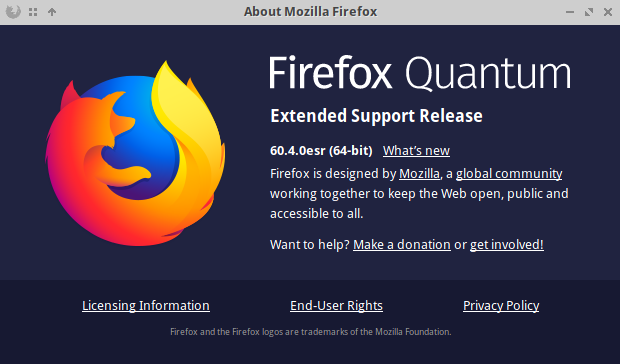 Man, I dislike Firefox 60. It just looks "wrong". The address bar is so small I can't see all of the url I am at. Do you have many extensions? They could be taking up space that would otherwise be available to the address bar. I miss a lot of the old extensions but managed to find some decent replacements for them. I use a pihole which covers all devices on the network, worth a try.